I am going to try my best to just give you a fishing report and stay out of the politics the best I can. I will however try to clear a few things up that have been on my mind. The Henry’s Fork Foundation does not control the flows out of island park dam. The Henry’s Fork Foundation has no say or legal right in deciding water rights. Rob Van Kirk is an actual scientist. You can address him as Dr. Rob Van Kirk. Last I checked you have to earn the right to be called a doctor. There is a difference in turbidity and silt. Farmers in our area also have the right to make a living and the fact that the Henry’s Fork Foundation even has a seat at the table when it comes to water rights and irrigation issues is in itself pretty amazing. Get involved, get educated. Sitting on the bank of a river and spreading rumors, bad mouthing individuals or organizations is not helpful. Armchair science has no place in the discussion and is not at all helpful. Let’s talk about fishing! The flows in the ranch have dropped below 1200 cfs and mornings that wind is not blowing to bad the Trico fishing has been great. Long leaders and great eye sight will help you! The long leader is the easy part. The eyesight part for me is where the challenge is! I like to use an indicator fly. A #18 Para Wulff with a #20 Trico spinner trailing behind 6 to 8 inches behind will increase your odds. Look for Honey Ants to make an appearance shortly after the Trico’s are done for the day. Lawson’s Henry’s Fork Honey Ant will serve you well. Fishing in the Box Canyon has been a bit tough as the water dropped over the weekend. It only takes a day or two for the fish to adjust and the fishing in the box will improve. Small nymphs are the key. Try #18 green or brown Zebra Midges. I also like #18 red Lighting Bugs. The key is to make sure you’re going deep enough and you have the correct amount of weight. Two BBs will generally do the trick. Check and clean your flies often. 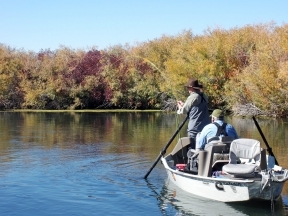 The Henrys Fork has been fishing very well this week. It seems to be the year of the Hopper! I don’t have a lot new to report on the Henrys fork. Hooper/Dropper rigs are still working very well and I would also have some streamers ready to go. Focus on the deeper runs and look for structure. Fish tight on the rock faces and look for trout hanging close to under water structure. A large rock or sunken log will often hold large trout. 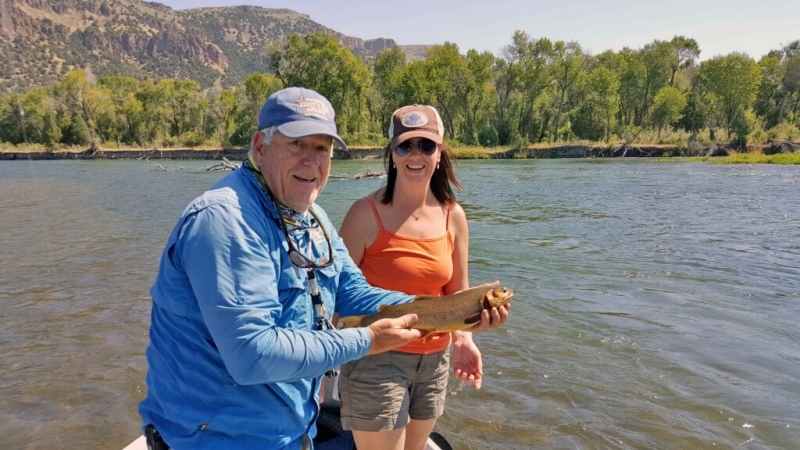 The upper Teton continues to fish well. Mornings and Evenings continue to be your best bet if you’re looking for dry fly action. Caddis are still going strong so #16 E-Z Caddis in the morning will work well and I like to fish #16 Spent Partridge Caddis in the evenings. I would have Hoppers with you once the day starts to heat up. The Moorish Hopper in tan or yellow will serve you well. I also really like Rainy’s Hopper. Don’t forget small beads heads. #18 Zebra Midges in different colors will work well. The South Fork early morning mutant stone bite is on! Just like last week’s report the key is to start early in the AM. I think the lower canyon is the place to be for this hatch. Drop your boat in at the first hint of light and fish the banks hard. Cast Berrett’s Mutant Golden Stone in tight on the bank and skate it off. The tighter on the bank the better. 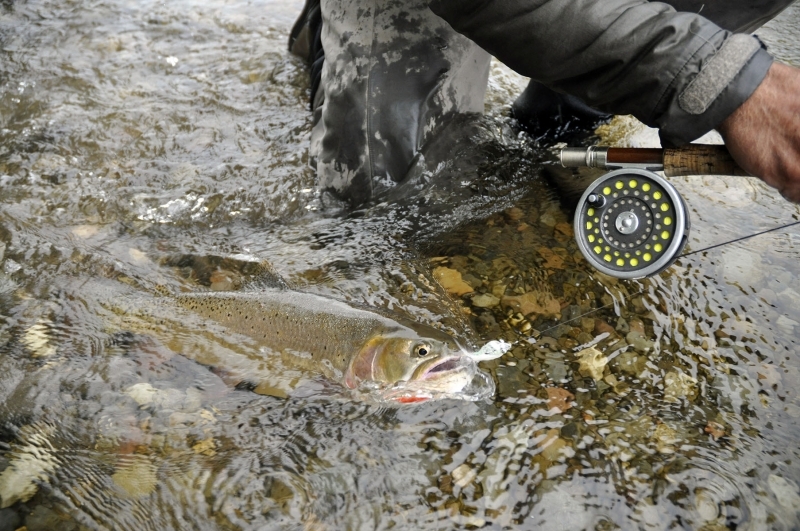 It may cost you a few flies but you will also have some shots at some amazing trout! Once again smaller bead head nymphs as the day heats up. 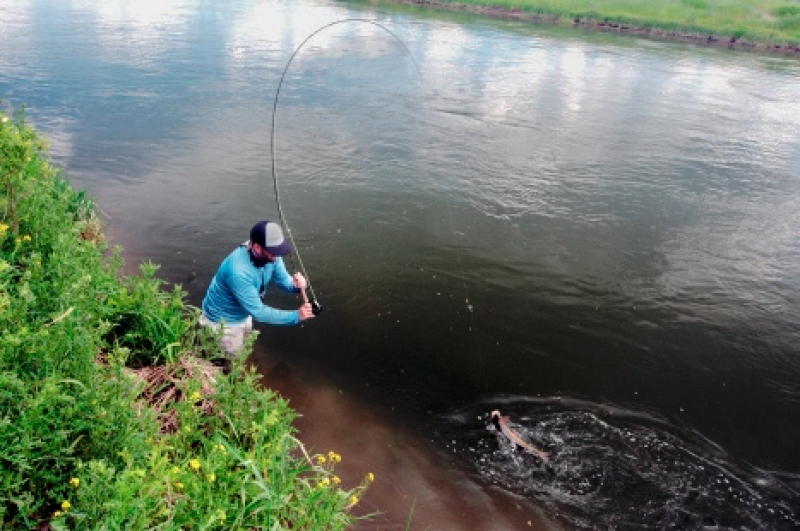 The trout in the riffles have most definitely became a bit more wary than they were back in early July so you may have to work a little harder. Don’t be afraid to down size tippet and also fly size. Instead of a #16 pink No-Hackle try a #18. Again not a lot has changed. I would be on the water at first light and skate Mutant Golden Stones until the day heated up and then hopper/dropper time until things cooled off. I would also have streamers close at hand. The Olive Matuka is one of my favorites. I also like wool head Sculpins in black and olive. Yellowstone National Park is hands down is one of the most magical places on earth to fish. This past weekend I walked into the first meadow of Slough Creek with Scott Kennedy. If you have never paid a visit to Slough Creek I will tell you it’s worth every step! The Cutthroat in the first meadow this time of the year are as tough as they come and the scenery is second to none. I did manage to fool a few fish into eating a #16 Missing Link Caddis and also had a few eats on a #14 gold Chubby. 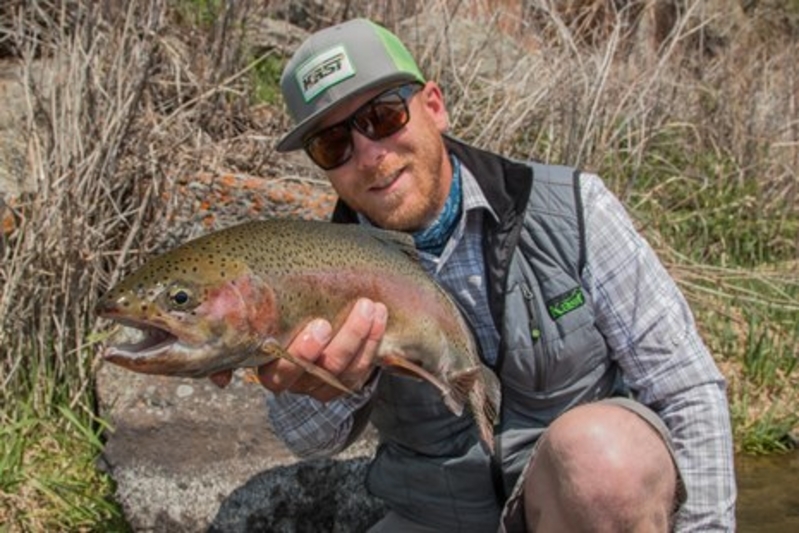 Scott however put on a clinic sight nymphing with a San Juan Worm. He landed close to a dozen fish.